TeamViewer 13, the latest version of the secure remote desktop access and support application, comes with iOS screen sharing functionality and usability improvements. 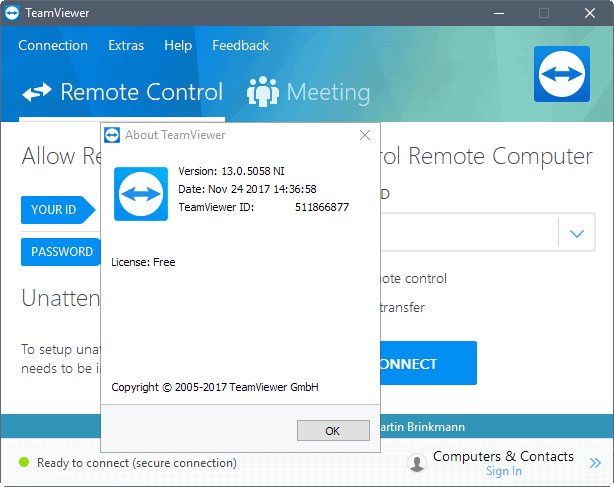 TeamViewer GMBH launched a public beta of TeamViewer 13 on October 30, 2017. That version has now been promoted to final, and users from around the world can download the new version of the remote desktop software. Users and customers may download the new version from the official company website, or select Help > Check for new version to run a manual update check in the client. The new version of TeamViewer comes with a long list of changes and improvements. One of the main new features of TeamViewer 13 is better support for iOS screen sharing. The updated QuickSupport app for Apple's iOS system offers better screen sharing capabilities so that you can share the screen with other devices including Windows, Linux and Android devices. The development team improved the usability of several key areas. Recent connections is a new option that lists connections by recency so that it is easier to re-connect to these without going through the full list of contacts and computers. It lists the last ten connections, and works in all other regards like other contact groups. File transfer improvements with a new job queue option to queue transfers and sent them one after the other, better access to recent folders and the file transfer history, and an improved file transfer window. Improved log on times thanks to encrypted caching. Remote Printing support for Mac devices, and full compatibility with HP printers. Extended Remote Device Dashboard provides information on S.M.A.R.T. data, battery, uptime, BIOS and more. Image processing supports hardware acceleration in TeamViewer 13. Essential Asset Management lists information about devices including operating system and hardware info. Windows and Mac TeamViewer client has been modernized. Establish remote connections from any tab. Automated Service Case Assignment to set a default assignee for QuickSupport and Host modules. Android application updated with improved Computers & Contacts usability and new design. Support for Android Host Eco-Mode (always-on support while conversing battery and data). Support for Samsung KNOX API on Android. Multi-monitor support on a remote Mac device. Better integration of TeamViewer GUI on Linux. I would not use or recommend this even if they paid me to. – you forgot to mention: their server was hacked (back in 2015?) with millions of user accounts. What if it happens again? They won’t tell you, you can bet on it, same as last time (not a single statement that “We were not hacked” only the “loud silence” about it). – How can you trust (and recommend) them after this? – was this “review” paid by TeamViewer? These kind of services should be avoided and used only when no other options left with caution, they are not trustworthy anymore. They never were. I really, really, really regret updating to TeamViewer 13. So many bugs are still not fixed, and the usability of the main screen is just atrocious now. * Instead of keeping the two window method (one for connecting, viewing your own ID etc, and the other for your contact list), they have now merged into one window with tabs. Why? There’s so much wasted space now. * You can no longer right click devices and go into properties from there. You have to left click the device, move the mouse to select the settings cog in the top right corner then click properties. Pointless extra click. * They still haven’t fixed the bug with TeamViewer sessions hijacking the Tab key and other keys, even when the window is not in focus. This has been going on since at least TeamViewer 11. Numerous support emails have been sent, nothing has ever come of it.